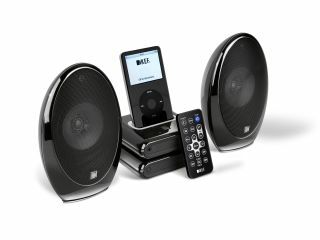 Hi-Fi experts KEF have announced the launch of a new high quality iPod speaker dock, and it's aimed squarely at those who can tell the difference between good and bad sound. KEF says that the already-bloated iPod dock market is dominated by "poor plastic tat" and so it's built the new Picoforte One music system, which apparently kicks out a huge, high quality hi-fi sound from a compact package. The deceptively simple, entirely digital system hides an impressively powerful 50W class D amplifier, and looks great with a glorious finish and a feel coupled to a similarly beguiling sound. Each Picoforte One component - both dock, amplifier module and speakers - is milled from die-cast zinc and clad in either high gloss black or white for a coolness of touch. KEF says this is impossible to recreate with synthetic materials. The fact that the loudspeaker cabinets are entirely metal means they are almost completely inert making for a far superior sound performance compared to the cheap plastic ones you might find elsewhere. And despite measuring a dinky 16cm high, the two loudspeakers weigh over two kilos. These speakers are enhanced versions of the award-winning KHT Series designs with Uni-Q technology. This means you get the biggest, widest sound dispersion from the smallest possible package. And with 25W powering each 7.5cm mid/bass driver and 15mm aluminium tweeter you'll be surprised at the scale of the sound that can be achieved. The Picoforte One is compatible with every current iPod and KEF hasn't forgotten about other MP3 players either - it's included a 3.5mm audio jack. An optional subwoofer connection means that lovers of bass can upgrade the sound still further. It also has an S-video connection means that you can use a screen to display song titles (in a wide range of supported languages) or even play movies (if your iPod allows). Completing the package is a credit card style remote control, which offers complete control of your iPod. The KEF Picoforte One l be out in August and will cost you £250.